Nutritional Supplements for The Social Drinker, the Alcoholic and Chemical-Dependent. Alcohol and drugs wreck havoc on the body. Recovery involves a great deal more than abstinence. Building up the body after abuse is critical for a full recovery, just as it is important to build up self esteem and build a reliable support group. This book reviews important nutritional supplements to aid in the restoration of health in the alcoholic and chemically-dependent. 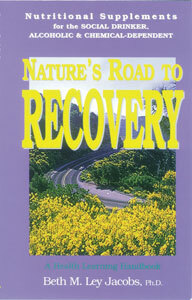 The author, with the help of a team of specialists, discusses common problems associated with alcohol use and abuse such as memory loss, sleep disorders, depression, liver problems, stomach ulcers, capillary damage, irritability, stress, sexual problems, etc., and offers suggestions for nutritional supplementation to aid in the recovery process. Find out how 5-HTP, St. John’s Wort, DHA, phospholipids, antioxidants, Milk thistle, Kava, and many more supplements (easily found at your local health food store or drug store) can help.